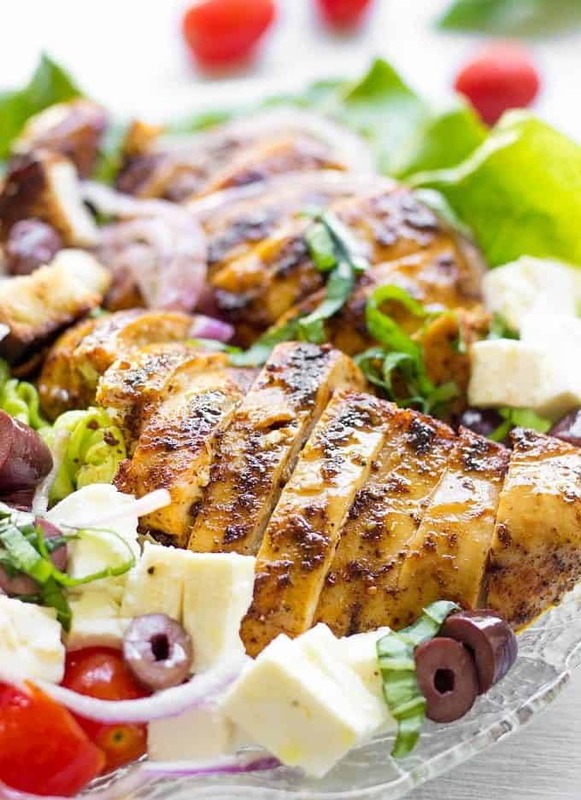 Herb-smothered grilled chicken, fresh veggies and crunchy croutons produce an epic Grilled Chicken Greek Panzanella Salad. It’s a feel good summer recipe your family will love! After all these years (two years to be precise) of writing a food blog, I’ve just realised that this is the first time I’m sharing a recipe of Greek cuisine. It’s quite weird though, because I adore Greek food and Panzanella salad has been a love of mine for a quite some time now. It’s safe to say, that it became one of the most popular salads in my house. So it is no-brainer not to share this awesome recipe with you. If you guys noticed, lately I’ve been sharing a little less recipes. Not that I ran out of ideas. No way! Summer of all the seasons is usually the slowest for most bloggers. The weather is great and everyone wants to spend more time outside and less time sitting on the computer. Having said that, I figured the timing couldn’t be better to concentrate more on learning a business side of blogging and improving my food photography. Now, that my older daughter goes to preschool full time, I have slightly more time to do all that. I’m pretty sure I shared this life detail before, but me and my husband try to eat healthy most of the time. We still like to indulge from time to time. But after frequent BBQ parties, which are always abundant with meat and not always healthy food, we love to switch to lighter food choices that are good for your body. Lately, we’ve been fans of making a salad for dinner. One huge bowl of salad after which you just feel good. Classic Greek Salad has always been a popular guest on our table, but after I tried Greek Panzanella, I loved it even more. What makes it really special? Definitely homemade croutons. So easy to make and they add that necessary kick of carbs that will make you feel full longer. If you’re on diet and try to limit carbs, feel free to skip croutons. Otherwise, for added healthy benefits, I recommend using Ancient Grain Bread or any other Multigrain Bread. A few words about chicken. Generally, my husband doesn’t like chicken breast. He always complaints that it comes out dry. Well, not after I made this salad. I smothered my chicken in a blend of spices and grilled it to perfection. My husband couldn’t help but compliment me for a delicious and perfectly done chicken. It was that good! Most of the time I use my stovetop grill pan, but you can definitely cook chicken outdoors. My true and tried method to ensure the chicken is perfectly cooked is to use meat thermometer. I know, many of you guys can define the readiness of a meat just by looking at it. But for me, this is a sure way to overcook it:) So I always use a thermometer to ensure the meat is just right and I recommend you do to. Lightly brush your stovetop grill pan with olive oil and heat the pan for about 4-minutes on a medium heat. In a small bowl combine all spices for grilled chicken. Brush chicken with olive oil and generously rub it with a mix of spices. 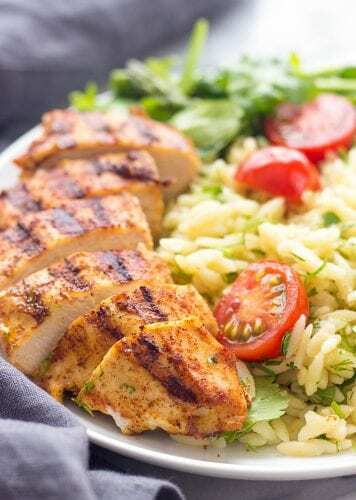 Place chicken breast on a grill and cook it untouched for 4 minutes. Flip to the other side and cook for 4 more minutes. Transfer chicken together with a grill pan into the oven and cook for 9 minutes or until the meat thermometer inserted in the beginning of baking reaches 165 F. Remove from the oven, let the chicken cool and slice it into ½ inch pieces. Meanwhile, heat a medium skillet and over medium heat for 4 minutes. Add 1 tablespoon of olive oil and diced bread. Toss the bread to coat in oil and toast until slightly browned on sides, about 4-5 minutes. Remove from the heat and set aside. In a large bowl combine all Panzanella ingredients, croutons and grilled chicken. In a small bowl whisk together all vinaigrette ingredients and drizzle over Panzanella. 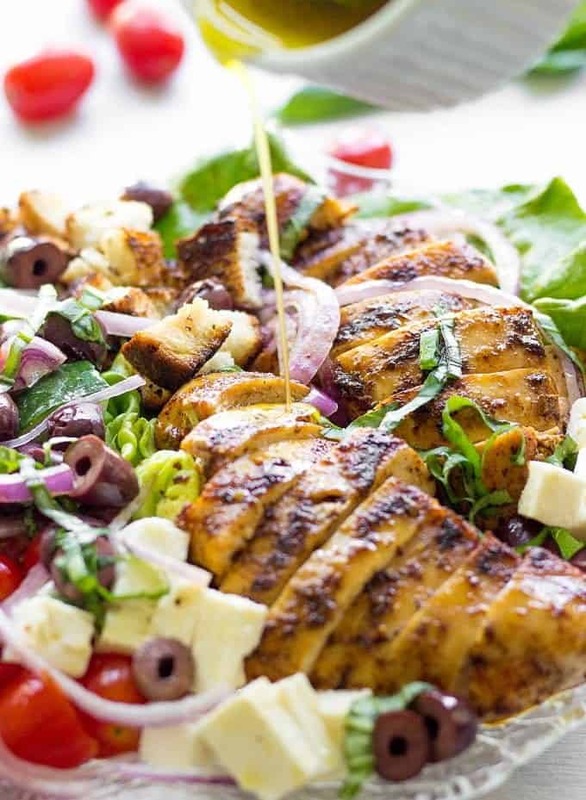 This Grilled Chicken Greek Panzanella Salad is definitely summer comfort dish. It has all the necessary ingredients to make you full and happy. Now, what is your favorite summer go-to dish?